Impact investing, as defined by the World Economic Forum, is an investment approach that intentionally seeks to create both financial return and positive social or environmental impact that is actively measured1. The targeted financial return can range from conservative to growth and the social impact can vary across a wide spectrum of themes. The impact investment market has provided capital for some of the world’s most pressing issues in a variety of sectors including, but not limited to, community development, affordable housing, small business finance, health & wellness, education, microfinance, sustainable consumer products, conservation, renewable energy, and sustainable agriculture2. The idea of investing based on personal values is not new but has evolved over time. Socially-Responsible investing (SRI) has been around for decades and revolves around negative screening to avoid investments in industries such as tobacco or weapons. Sustainable investing came along later and is a subset of SRI. In this case, investors seek to utilize positive screens for companies that demonstrate socially-responsible behavior and utilize Environmental, Social and Governance (ESG) practices3. Impact investing integrates some aspects of both as well as additional core characteristics including intentionality and the ability to measure and report on the social and environmental impact. Investors must intend to produce a specific positive impact4. Further, impact investing differs from philanthropy such that the objective of philanthropy is to support social and environmental change through a charitable donation5. In other words, the donor loses the money and receives no financial return. 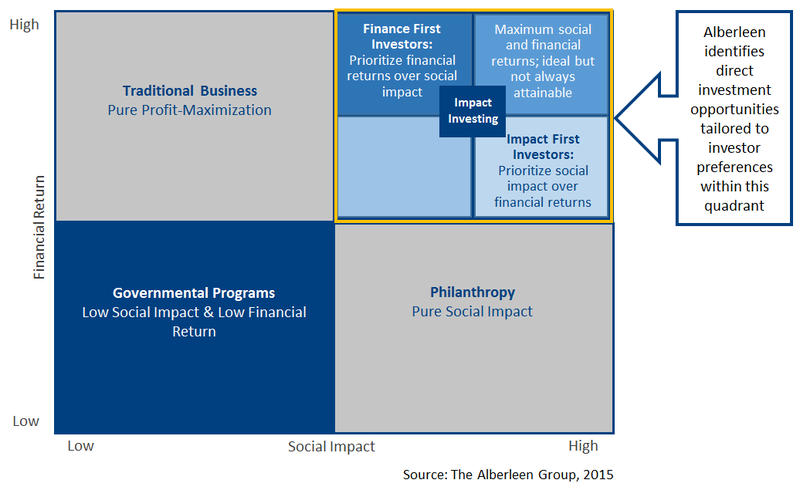 Below is a chart, by the Alberleen Group, that maps financial return compared to social impact. The Alberleen Group identifies direct investment opportunities tailored to investor preferences within the Impact Investing (top right) quadrant. Investing for an impact has grown dramatically in the last few years. According to a 2013 Financial Times survey, 15% of family offices made impact investments prior to 2000 while 29% of family offices have made impact investments after 20105. Today, impact investments represent an average of 17% of family office assets under management worldwide6. There are several trends that will continue to enhance the growth among family offices, multi-family offices and family-backed foundations. First, many family offices are exploring impact as a way to connect family values and perpetuate wealth. It is estimated that nearly 60% of wealth is lost by the second generation and 90% by the end of the third2. If younger generations feel a connection to their family’s wealth, they are more likely to preserve the capital. Impact investing can act as a bridge for, not only wealth, but values to pass down from generation to generation. Families can unite under a variety of causes that are important to them while maintaining and even growing their financial base2. For example, the W.K Kellogg Foundation is dedicated to help vulnerable children achieve success. The foundation invested in Wireless Generation, which creates systems to improve teaching and learning as well as customizes instruction, with the goal of improving the educational outcome for students7. Another example can be seen through the Rockefeller Foundation, the foundation that coined the term “Impact Investing”8. The foundation’s mission is to promote the well-being of humanity around the world8. It made an investment in the Disability Opportunity Fund which focuses on developing affordable housing and other services for individuals with disabilities9. Another source of growth pertains to who wealth will be transitioning to over the next several years. As the Baby Boomer generation ages, projections show that Millennials will inherit approximately $40 trillion over the next 4 decades2. Younger wealth tends to be more focused on improving society and making a difference with their money as can be seen by the chart below, by US Trust, which shows that 67% of Millennials believe their investment decisions express their social, political or environmental values versus 36% of Baby Boomers. There is also increasing demand from women. According to a survey, over half of wealthy women are interested in environmental or socially responsible investments as compared to one-third of men and it is estimated that by 2030 two-thirds of private wealth in the US will be held by women2. Further, it is worth noting that, certain government policies have been established to incentivize impact investing. For example, the UK government provides a 30% tax relief for social investments which they anticipate will stimulate approximately GBP 500M in additional investment over the next 5 years10. We would not be surprised if that trend continues. Overall, consumers around the world are more concerned with positively influencing society than ever before. Nevertheless, the space is still very early on in development and must overcome several hurdles before becoming an established, mainstream asset class. Investors have encountered a variety of obstacles including unclear definitions, little resources providing information, conflicting generational viewpoints, limited qualified investment professionals, few investment opportunities with a track record, finding an ideal financial/social impact return balance, mission drift and, most notably, a standardized impact measurement metric5. Impact measurements today are subjective and unverified. Many investors use the Logic Model as a framework which employs a results chain beginning with the inputs to analyze the overall sustained significant change or impact11. Existing metric systems are limited in their capabilities. Impact Reporting and Investing Standards (IRIS) developed by the Global Impact Investing Network (GIIN) collects data on a company’s social, environmental and financial performance. Global Impact Investing Rating System (GIIRS) developed by B-Lab divides companies into 4 broad sectors but evaluates each company using the same criteria. Boundless Impact believes that detailed impact evaluation differs between sectors. As a result, they are constructing a new sector specific measurement system that would be the next positive step toward formalizing the space3. 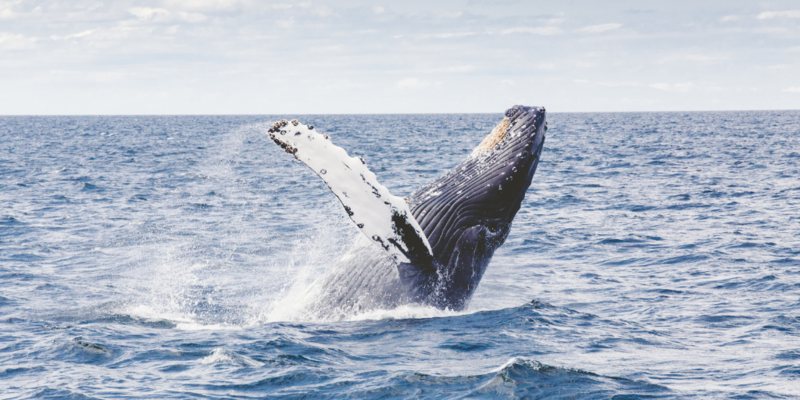 As can be imagined, the benefits of impact investing often require a very long-term time horizon; this time frame can often result in ongoing measurement difficulties. Impact investments can be made across asset classes and through a variety of investment vehicles including direct private deals, public security ownership and partnerships. For instance, financing via untraditional bond structures has become very popular. By way of example, The International Finance Corporation (IFC) and the World Bank have been combatting climate change by issuing green bonds to finance projects12. Green bonds have similar risk/return profiles of non-green bonds but the proceeds are allocated to eligible environmentally friendly projects that are verified by specialists13. Investors can also get exposure through public equity, real estate and infrastructure. One of the most common instruments is private equity or venture capital investment funds. There are few publicly listed companies that intentionally seek a social impact. Therefore, there is a greater opportunity through private companies. Investors can also make equity and debt direct investments into private companies2. There are a variety of ways to get involved. Many families find opportunities and deals through word-of-mouth. This method can limit an investor’s deal-flow and goal of creating a specific desired outcome. Another way would be to utilize a platform, such as ImpactBase, to search for impact investment funds and deals. While this would alleviate some of the headaches related to sourcing, investors would still need to conduct additional due diligence before making an investment. A final option would be to consult with a financial advisor who can help families achieve their vision. Financial advisors have the ability to connect families with asset managers who have experience in sourcing and vetting opportunities. Expertise in the field may help to maximize an investor’s financial and impact goals. One major drawback would be additional fees. Impact investing contests the notion that a financial return should be an investor’s sole focus. The market allows investors to make a difference with their wealth while still reaching financial goals. Further, it can connect family values across generations. There is no question the space is still evolving but it continues to gain the attention of an increasing number of players, including Massey Quick. We are early in our research phase but believe impact investing is a growing field with many beneficial attributes despite the current challenges. We are open to conversations with our clients and their families to discuss transitioning wealth and the benefits of impact investing. 5 Keating, Giles. Schoning Mirjam. “Investing for Impact: How Social Entrepreneurship is Redefining the Meaning of Return.” Research Institute. Eds. Robert Rultmann. Patrick Elmar. Gregory Flaming. Laura Hemrika. Zurich, Switzerland: Credit Suisse AG, 2012. 6 Boulton, Leila. “The 100% Club: An Increasing Number of Rich Clients are Devoting All Their Assets to Impact Investing.” Private Wealth Magazine. March 2015. 28-34. Print. 11 Ebrahim, Alnoor. Rangan, Kasturi V. “What Impact? A Framework for Measuring the Scale and Scope of Social Performance.” California Management Review. Berkeley: University of California Press, 2014. 118-141. Print.